IFA NEWS: Harman Kardon’s GLA-55 finally breaks cover | What Hi-Fi? “From its inception, the Harman Kardon design and engineering teams worked in tandem to create the aesthetics for the GLA-55 system,” explains Laurant Rault, International Brand Manager - Multimedia & Headphones at Harman Consumer. The speakers – which will hook up to your computer, iPod or anything else with a 3.5mm output – feature 100W of digital amplification (56 watts per satellite), DSP equalisation, and patented CMMD tweeters and Atlas drivers. They also boast touch-sensitive volume controls, a subwoofer output and a chrome base. 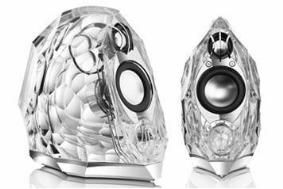 Each GLA-55 speaker measures 14x27cm and weighs 1.2Kg. The Harman Kardon GLA-55 will cost an ice-cool £799 per pair, and will be available via suitably high-end retailers – including Harrods - later this year. We hope to review the beauties shortly.